As they lost their thrones, many royal families struggled to hang on to their jewelry, too. 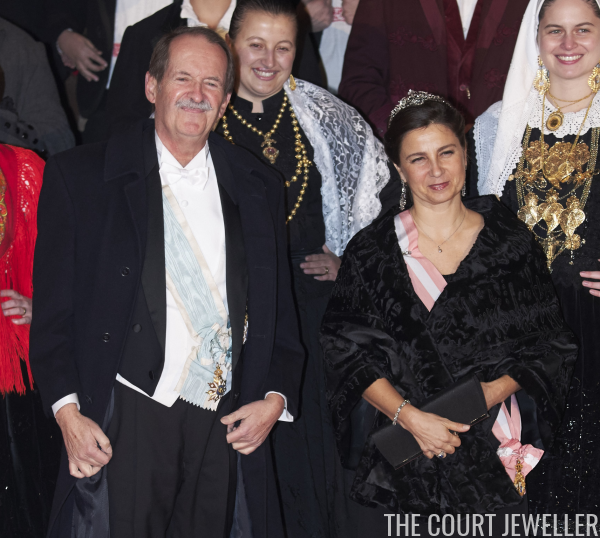 But, thanks to the careful planning of ancestors along the way, the current pretender to the Portuguese throne and his wife still have quite a jewelry collection at their disposal. Today, we're looking at the floral diamond suite from the Braganza collection, which includes a necklace that can also be worn as a tiara. Precious little is known about the provenance of this suite of diamond jewelry, but we do know that it's been in Isabel's jewelry box for at least 15 years, and she has worn it for prominent gala occasions in Portugal and abroad. In April 2006, a little more than a decade ago, she wore the necklace and earrings at a private dinner celebrating King Carl XVI Gustaf of Sweden's 60th birthday. 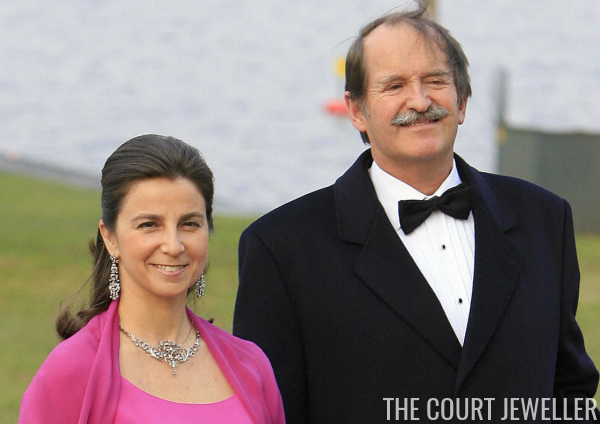 Here's a closer view of the necklace and earrings from their Swedish royal outing. The central element on the necklace, to me, is reminiscent of the Edwardian Tiara worn by Crown Princess Mary of Denmark. Perhaps Isabel's jewels date to around the same time period? In Monaco in 2011, Isabel wore the diamond earrings from the suite with another family tiara, the diamond bandeau. She also pinned a brooch to her dress that appears to have a floral design, but I don't know if it's part of the same collection of jewelry. 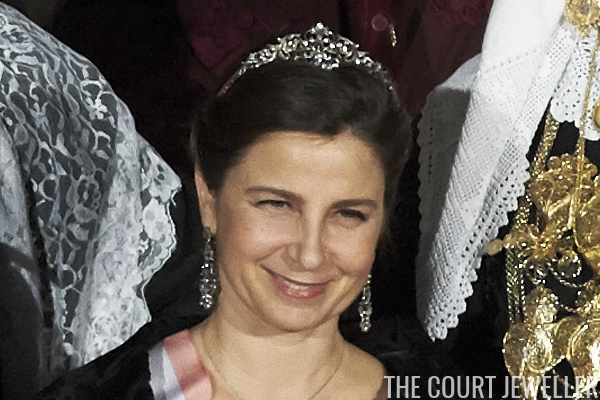 In November 2016, we got to see Isabel wear the necklace in its converted tiara form. She wore the tiara with the coordinating diamond floral earrings during the Spanish state visit to Portugal. This wasn't the first time that Isabel had worn the necklace as a tiara, but it's currently the most recent. 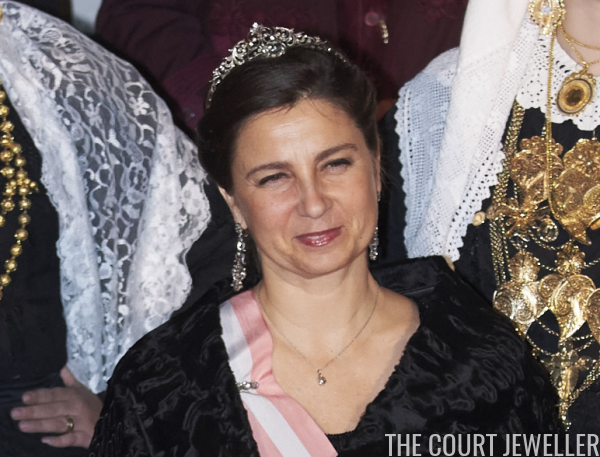 Although the Portuguese royals haven't had a throne for more than a century, the Braganzas have held on to quite a lot of royal jewelry, and Isabel has several tiaras to choose from, so this workhorse piece is only one of the sparklers she wears at gala events.